Instead of filling up premium space with banner ads, go ultra premium: let advertisers publish their promotions on your site any time of day. Think of it as native meets banners. This works especially well for advertisers that would like to promote lots of different products, services and promotions to your audience. How it works: You set up a dedicated ad zone on your site, preferably on the home page or in a premium spot. Create an author level on your site that lets your advertiser log in and add promotions any time of day (moderate the promos if you wish). 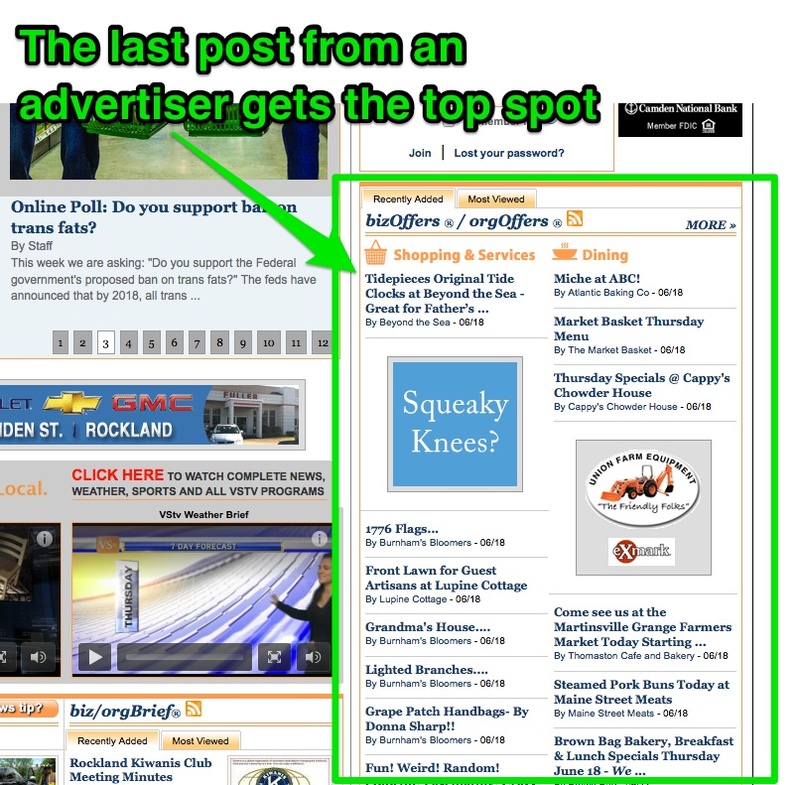 Promos run from top to bottom (see image below) in your ad zone. A new promo that is published will push the previous top promo down 1 spot. This creates a naturally competitive cycle of advertisers logging in to publish what they want to promote in your top spot. The best part? Your readers will love it. They will get real time promos for your advertisers faster then they could anywhere else and that adds value to your publication. See how the most recent ad posts get to sit at the top of the bizOffers section? These ads are published right on the home page and advertisers are publishing daily to promote their offerings. All they do is pay for the service ($20/week), log in and post their promo. 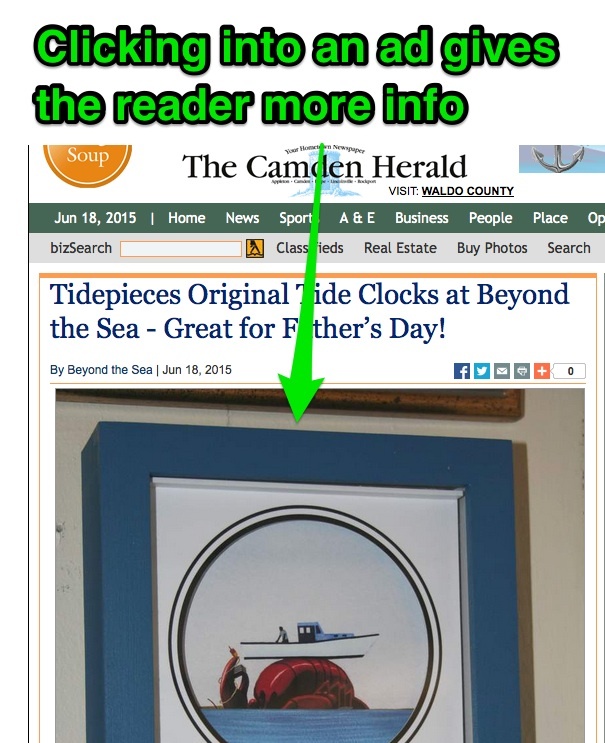 If you click through an ad post (see image below) you will see that advertisers can publish images, text and video. Profitability: I have been watching the Camden Herald for over 5 years now and seen their bizOffers section grow over that time. I don’t have hard numbers but at 300 advertisers they would making $312,000 per year just from their ad bloggers. Bonus visibility: Each ad post that is published gets picked up by Google search and is easily shared in Facebook sending the site more visitors. Advertisers can post their promotions any time of day with text, photos and even video, right in your most premium ad location… the advertiser that posts a promotion last gets the top spot. This encourages advertisers to log in frequently and publish their offers. Challenge: the hardest part of managing this type of ad network is educating your advertisers as to what it is, how they will log in and gain access to your site, and you also need to remind them to do it (keep an ad blogger email list going). If you publish with WordPress and would like to add this type of revenue to your publication check out the AccessAds plugin. They have all proven to work. Try different approaches and pricing models. You can combine them all if it makes sense for your audience or create one very streamlined experience. Think about who your audience is and talk to them to find out what motivates them. Only you can make your own secret profit sauce.